The idea for the first heavier-than-air commercial airline came from the mind of Percival Elliott Fansler. 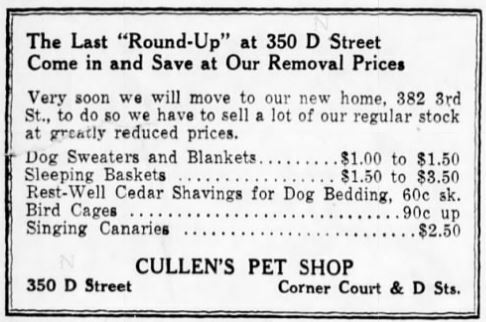 Fansler was the sales manager for the Jacksonville branch of a tractor company when he came across an article describing a 1912 long-distance flight from Omaha to New Orleans. 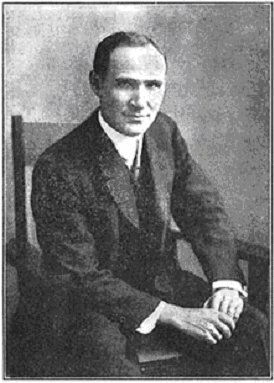 In the story, the airplane’s designer, Thomas W. Benoist, discussed the potential costs of carrying packages, mail, and passengers. This image of Thomas Wesley Benoist appears on the website airandspacemuseum.org. And just where would that somewhere and somewhere else be? Well, Fansler had the answer. St. Petersburg and Tampa, Florida. The two cities are fairly close to one another, but since St. Petersburg sits on a peninsula located between Tampa and the Gulf of Mexico, travel between the two locales in the early part of the twentieth century took quite some time. Your best bet would have been a 2-hour steamboat ride across the bay or a 5-hour trip by train. With automobiles still in their infancy, a trip by car on primitive roads was estimated to take nearly an entire day. But what if you could fly across the channel in far less time? 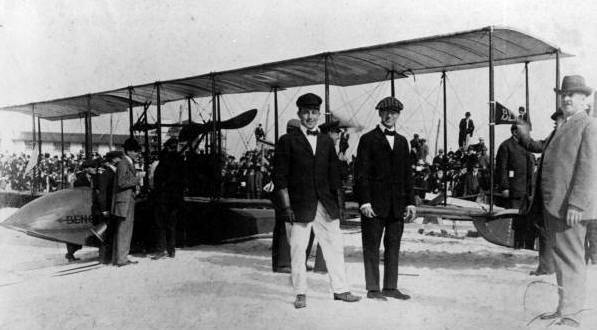 Together, these two aviation pioneers started the St. Petersburg-Tampa Airboat Line. The City of St. Petersburg agreed to contribute $40 per day for a period of three months as long as the airline flew two flights every weekday, whether they had a paid passenger or not. The contract with the city was signed on December 17, 1913, which just happened to be the 10th anniversary of the Wright brothers historic flight. 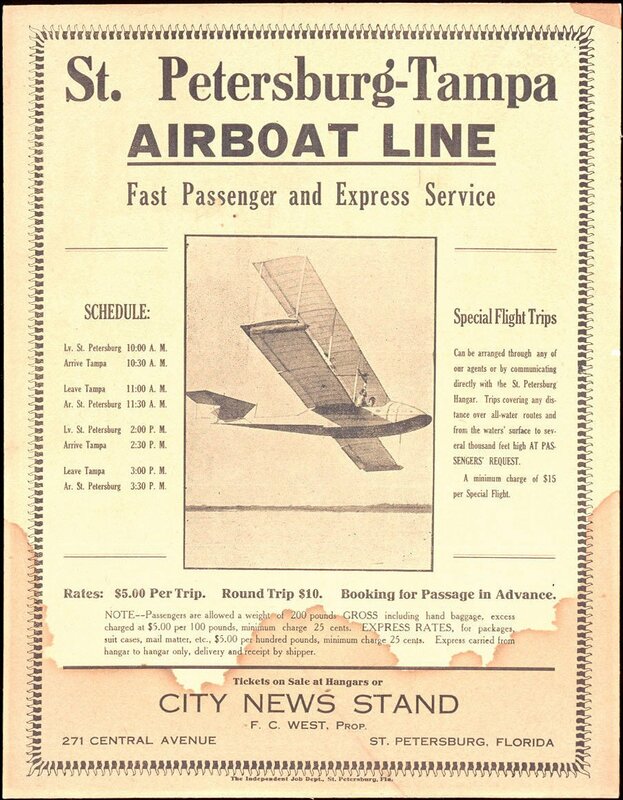 This advertisement for the St. Petersburg-Tampa Airboat Line is on display at the Smithsonian Air and Space Museum. Benoist hired flight pioneer Tony Jannus to pilot the plane across the bay. An auction was then held for the first round-trip ticket and the winner was former St. Petersburg mayor Abram C. Pheil. He paid $400 (approximately $9,700 adjusted for inflation) for the privilege of becoming the first paid commercial flight passenger. 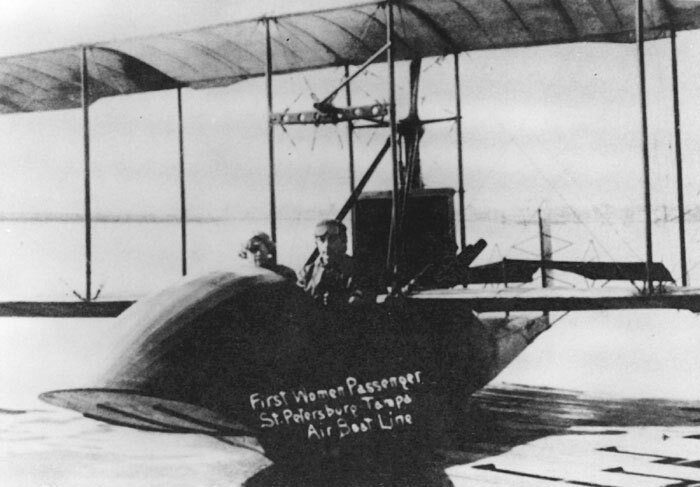 Word quickly spread of the planned flight and on the morning of January 1, 1914 a crowd of more than 3,000 people gathered on the beach in St. Petersburg – near the present location of the St. Petersburg Museum of History – and watched the inaugural flight of the newly formed airline. The 21-mile (34-kilometer) flight took 23-minutes, but was not without its hiccups. First, the plane never lifted more than 50-feet (15.2 meters) above the water surface. More significantly, the engine chain slipped off of the propeller shaft and Tony Jannus had to set the plane down on the water. Both pilot and passenger rolled up their sleeves and fixed the engine so that they could complete the flight. Tony Jannus (left) made history on March 1, 1912 when he piloted Albert Berry to make the first parachute jump from an airplane ever. The parachute is in the conical shaped container under the plane. The next day, Mae Peabody of Dubuque, Iowa, became the first woman to take a commercial flight. The cost for a one-way ticket was $5.00 ($122 today) and they sold out 16-weeks of flights almost immediately. It was so successful that a second plane was added, piloted by Tony Jannus’ brother Roger, and they extended some of the flights to Sarasota. The first woman to buy a ticket on an airplane was Mae Peabody of Dubuque, Iowa. She can be seen here with pilot Tony Jannus. The St. Petersburg-Tampa Airboat Line continued operation until May 5th. During the four months that the airline was in business, they made 172 flights carrying a total of 1,205 passengers. 86% of its scheduled flights were completed with an estimated 90% of the flights paid for. Service ended due to two factors: First, all of the snow bunnies headed back north for the summer and demand for flights dropped off significantly. And, since the city’s funding had expired, running the airline was no longer profitable. While the airline was dissolved, it did prove for the first time that airline service could be practical, reliable, and, most importantly, safe. • Pilot Tony Jannus was killed on October 12, 1916 while training two Russian pilots and crashing into the Black Sea. • His brother Roger was killed while flying an air patrol over France on September 4, 1918. 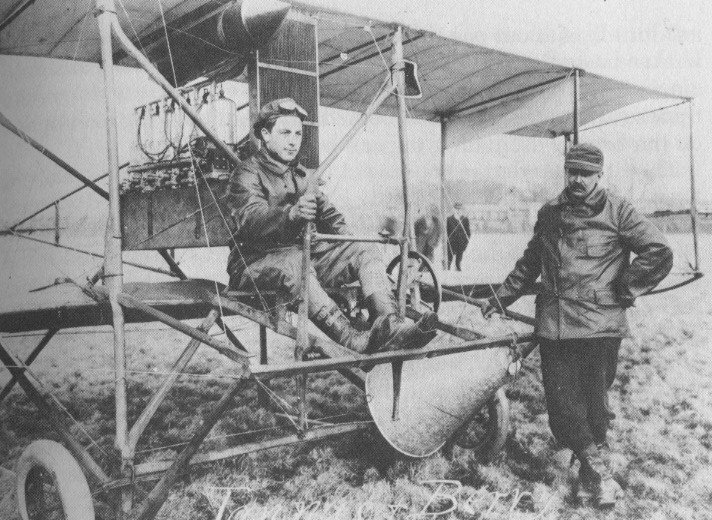 • Airplane designer Benoist died on June 14, 1917 when he stepped off of a streetcar in Sandusky, Ohio and struck his head against a utility pole. • As for the historic plane that he designed, it didn’t last much longer. It was sold off and was destroyed after crashing into Pennsylvania’s Conneaut Lake. • Passenger Pheil succumbed to cancer at age 55 on November 1, 1922. 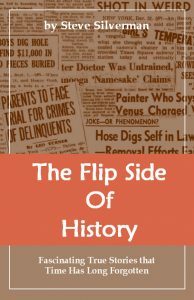 • The man who thought up the idea of a commercial airline – Percival Fansler – practiced as an engineer for multiple companies before becoming the editor of a technical journal in New York City. He died in 1937 at 56-years of age.